There are lots of ways to lock doors. And most of them are perfectly adequate. But when you want to let people into your workplace – especially if that place doubles as your home or workshop –all of them require either too much trust (keys) or too much installation (most smart lock systems). Sesame aims to simplify the way you control your entry point. 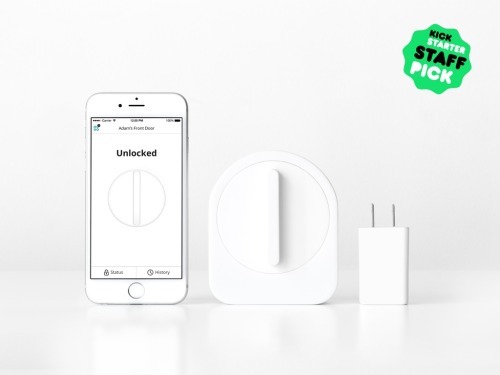 It works with the lock you have, requires almost nothing in the way of installation, opens the door with an app, lets you control who gets in, and tells you whenever anyone opens (or tries to open) your door. It’s also just slick as all heck. You can tap your phone – while it’s still in your pocket! – to unlock the door. Pledge $149 to this campaign and you’ll get the Sesame with Wi-Fi access before the rest of the world can pay retail. Forget huddling around a laptop screen or connecting a difficult projector. Just plug this into any light socket, point it at a wall or table surface and project from your Android or Apple phone. It works with any app and gets your game, project, movie, or presentation in front of the eyes of everyone in the room without a huge setup hassle. Movies on the wall? Presentations in the back of a restaurant? Games on a table (with an overheard light)? All easy to do. 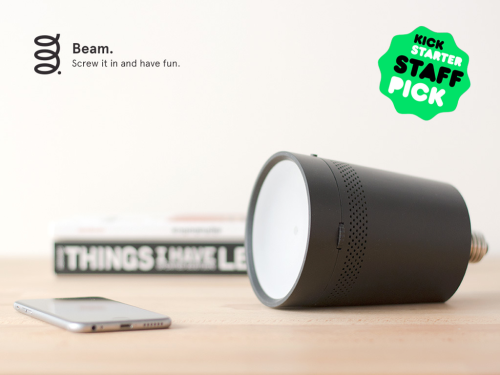 If you pledge $349, you will get a Beam as soon as they are ready and for the lowest price they will ever be. Have you ever been frustrated when your favorite TV show was cancelled by a network? Crowdfunding can prevent that. Rather than leaving the decision about what shows are worth it in the hands of executives who don’t even watch, it gives that power to you. And, for the same reason big business produce movies, it can be a great way to connect with potential customers. One famously cancelled show is the Sci-Fi series Firefly. It was written and directed by Joss Whedon and starred Nathan Fillion (Castle) and Alan Tudyk (Arrested Development). It was cancelled way too soon for its fans (this writer being one.) And those fans are legion and devoted. 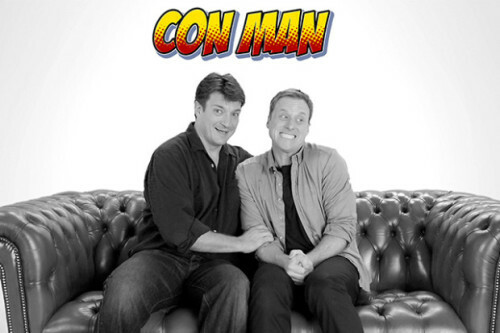 Fillion and Tudyk have taken to Indiegogo to prevent that fate for the Tudyk-written comedy, Con Man, about science-fiction convention characters. It looks like a show worth watching, especially for Firefly fans – since it’s based on them. If you put up $5K, you’ll get listed as an associate producer both in the credits and on IMDB, helping this huge body of devoted fans see you as one of their own. There are much smaller ($5 will get you something) ways to back this idea if you are – like me – just a fan. A lost wallet stops your whole day. It can cost you money, compromise your identity, and make you very unhappy. 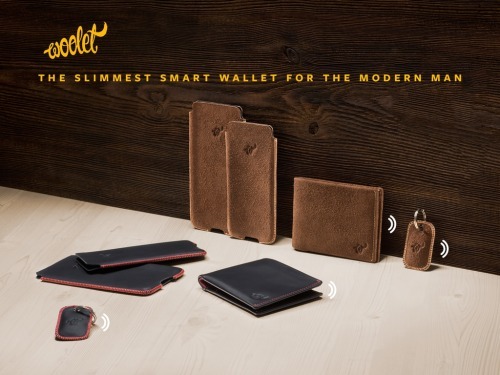 This smart wallet will alert you if you are about to lose it. If you try to leave without it, your phone will bleep (or woof) and tell you where the wallet is so you can go back and get it before your day goes completely south. This wallet is more than some plastic dongle you clip to your wallet. It is beautiful: Leather, hand-crafted, and aesthetically pleasing. It would make a great gift to help employees, contractors, and clients keep it together, too. More likely to lose your phone than your wallet? The Woolet two-way security will also alert you if you leave your phone behind. Throw $99 at this project and you’ll get the black version of the wallet ASAP. A smaller contribution will get you a phone case or key fob. Do you own a fleet of cars? Listen to the pitch on the campaign for Project Overlord. 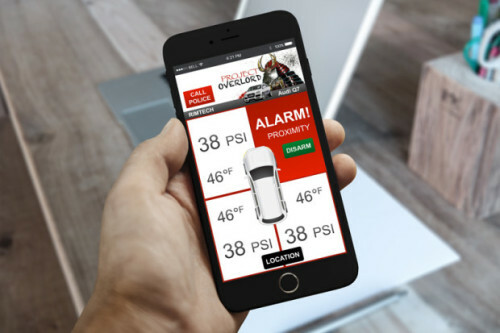 You might not be worried about the cars getting stolen – there is a lot of technology to protect you from that – but you apparently should worry about the tires being stolen right off the car. Tires are expensive, untraceable, and easy to steal. This system alerts you via your smart phone the second someone tampers with your wheels so you can leap out of bed and deal with it. It also alerts the authorities and emits an alarm to scare the thief. And it tracks the tires via GPS if the culprit makes off with them. Even if your fleet is made up of bicycles, motorcycles, or farm equipment, this device can protect it its wheels. Heck, even if your fleet is one bicycle, it’ll keep an eye on those two tires. $299 will get you one of the first ever working systems for one vehicle. That iPhone is amazing, right? Drop it in a pocket and work from anywhere. No need to lug a bag with a laptop. Oh, wait, though. You do need a bag for the charger plug, cable, and backup battery because the phone battery won’t last all day. Or you could back this campaign for an all-in-one iPhone case, charger, and battery. Then, when you get yours, put the phone in the case and the case in your pocket. When the battery gets hungry, press a button on the case to charge the phone. Is the case battery is dead, too? Oh no! Wait, no worries. 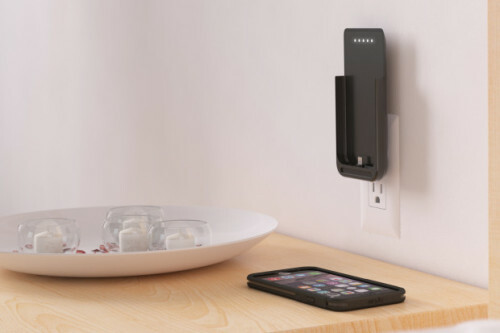 Pop out the prongs, plug it into the wall and charge away – with the phone in it. Or just charge the case and keep using the phone. It also has a microUSB port so if you do have a cable handy, you can plug the case in with that. Get one for the whole team and no one will be able to claim “Dead battery!” when you need an answer. A smart watch is a great way to stay productive, without stopping to stare at your phone. You could wait for the Apple Watch and pay $350 – or more. 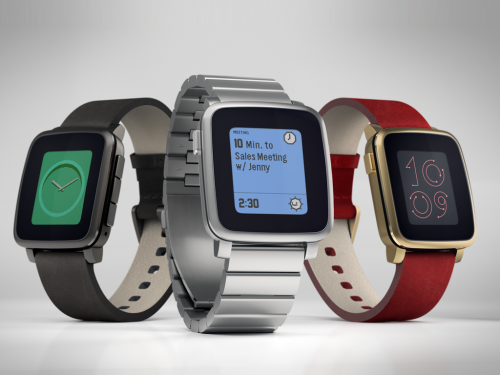 Or, hey, why not back the next iteration of the Pebble Watch – Pebble Time? This is the original smart watch. It’s been on the market for years so this new version is a response to what people want. And Pebble Time will work with whatever phone you have –iPhone, Android, Samsung – so if you change phones, you can still use your watch. It has a color e-ink paper face, is water resistant, has lots of app partners, a battery that lasts a week, and it will let you do voice replies and take voice notes right from the watch. The Pebble people built an interface for it – called Timeline – that is simple and keeps you informed about your day with just a couple of buttons. Back this idea for $179 and you’ll get the watch in your choice of three colors. 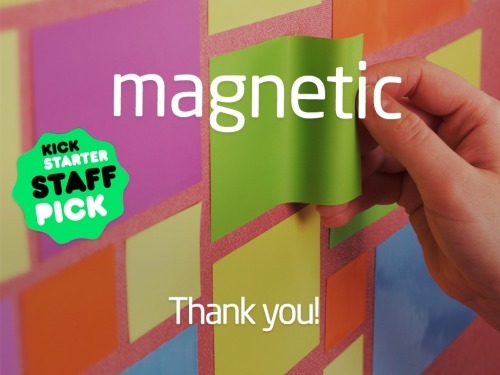 Post it notes, dry erase boards, sticky pads? These are the elemental office communication tools and they haven’t changed much in decades. But these? So much better! Especially if you don’t work in a traditional space with whiteboards and cubicles.They use a stable static charge to stick to any surface. Post it notes on the stone walls, fabric surfaces, on the fridge, on the potted plants, on the dishes in the kitchen, on your leather bag. Post-it or memo notes you can stick to any surface for quick alerts or signs? Exactly. Computer printouts you can stick to anything without stapes or glue? Absolutely. Big sheets that stick to any wall and create a movable dry-erase board anywhere? Sure thing. Back this project for less than $30 and you can get a note sampler. Or choose the format you want. And you will get your preference as soon as they are manufactured. All those notes you take in meetings? Where are they now? How much time do you spend typing notes after a meeting? Write your notes in this notebook and you won’t groan next time someone asks you either of those questions. 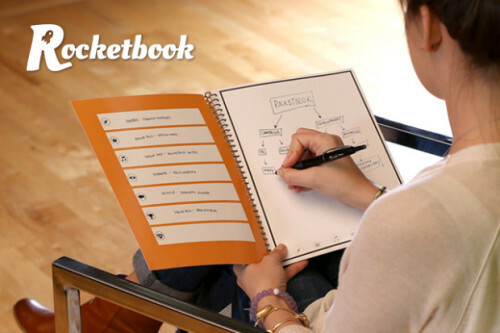 After you jot your notes (or drawings or doodles) snap a picture of them with the Rocketbook app. It processes the pages – two at a time if you like – and sends them instantly to where you like to store things in the cloud. Sometimes that might be an email. Other times, that’s Evernote or Dropbox. Icons on the bottom of the page tell the app where you want to send that page. Slick. And you don’t have to keep buying special paper to make this all happen. Just use the right kind of pen and pop the notebook in the microwave to erase everything in it. A $25 pledge gets you the standard notebook as soon as it becomes available.